There are currently only two Android Wear watches available for purchase, but HTC has been reportedly planning to throw its hat into the ring too. 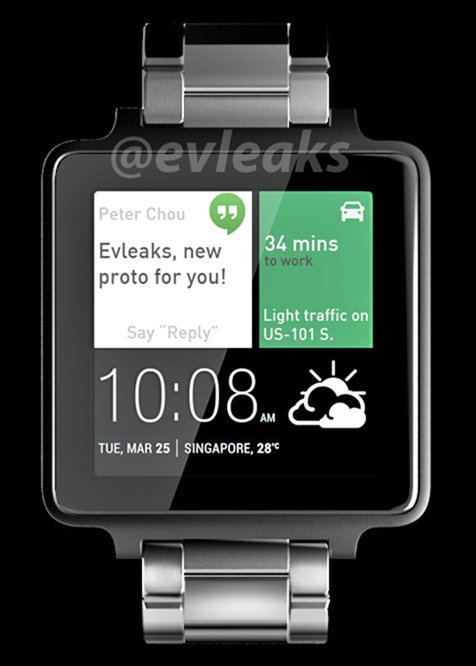 There's a new render of what may be HTC's Android Wear watch from @evleaks, and it's another square. First thing's first: this isn't the actual render obtained by @evleaks, but rather a reproduction of it. It's possible the original would have compromised a source, but he doesn't go into detail on that. Either way, the hardware is apparently faithful to the original. The real leak didn't have anything on the screen, so @evleaks decided to have some fun with it. Yeah, it makes it look fake because Wear can't be skinned, but ignore that. If this is real, HTC is going with a square watch, unlike Motorola's round Moto 360. Although, the bezel looks quite a bit slimmer than what you see on the G Watch or Gear Live. It also has a metal band, but bands are replaceable anyway. HTC's probably just trying to keep with its metal aesthetic by (maybe) shipping a watch with a metal band. We have no information about when or how much, assuming this is real and actually in the pipeline.